Lee Keum-seom, a 92-year-old South Korean woman, was reunited with her now 71-year-old son yesterday after 68 years apart. The two had last seen each other when her son, Ri Sang Chol, was 4-years-old. They became trapped on opposite sides of the demilitarized zone (DMZ) between North and South Korea during the 1950-1953 Korean War and have not communicated since. Lee wept as she fell into her son's arms. Ri showed his mother a photo of her late husband, who had stayed behind in North Korea, saying "Mother, this is how my father looked." Lee and her son are just one of 89 families who were selected from more than 57,000 applicants for this brief, emotional reunion. The reunions were agreed upon as part of the Panmunjom Declaration that was signed by South Korean President Moon Jae-in and North Korean leader Kim Jong Un earlier this year. More than half of the reunion participants are over 80-years-old. Many had not even known if their relatives were alive because they couldn't even call, write, or email across the border. The three-day reunions are taking place at a resort near Mount Kumgang. The South Koreans first gathered south of the DMZ where they received medical checks, registered their names, and had professional photos taken and framed to bring to North Korea as a gift for their relatives. They were also warned to be careful about what they said north of the border, to not say anything that could be interpreted as being insensitive, in case it would negatively affect their North Korean family members. It is estimated that there are currently 600,000 to 700,000 South Koreans with immediate or extended relatives in North Korea. 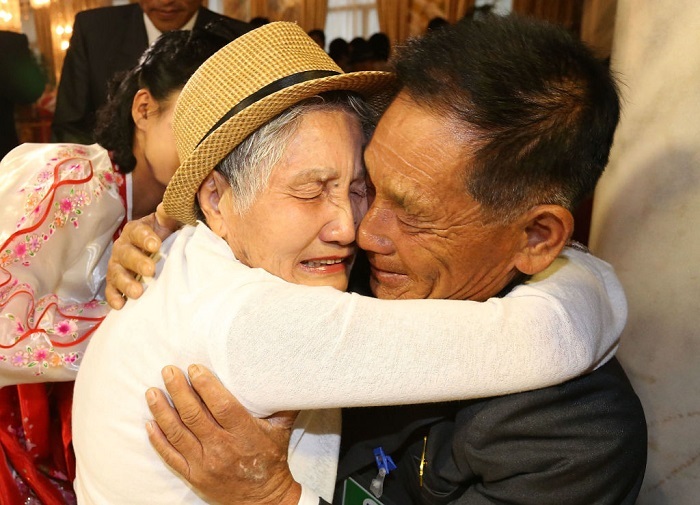 More than 132,000 South Koreans have applied to take part in the rare reunions, but 75,000 have thus far died while waiting. The oldest person to join this round of reunions is Baik Sung-kyu, who is 101-years-old. He brought many gifts for his 48-year-old North Korean granddaughter, including toiletries, shoes, and clothes, saying "This will be the last [time we meet], so I have brought a lot." Though the reunions will take place over three days, the families will only be able to meet for a few hours each day, totaling just 11 hours of time together. It is believed that North Korea chooses their participants based on loyalty to the regime. South Korea uses a lottery system. While South Korean President Moon Jae-in is pushing for more family reunions, North Korea has been reluctant. Experts believe that this is because North Korea sees the reunions as a negotiating asset.